Unless you have lived in your home for many, many years, you may not yet have reason to know much about replacement windows. I know I certainly did not know anything about replacement windows until I needed to know about them! Truthfully, most don’t think about their windows, doors, patio doors, flooring… none of the home’s major components until they need to. “Need” = too late! By the time we homeowners need to think about replacement windows, there’s something broken, inoperable, or deteriorating. Or, there’s rainwater and melting snow seeping into our homes, blowing drafts, and guests pointing out the “peeling windowsill paint!” Embarrassing and uncomfortable! Okay, so let’s get you thinking about replacement windows now—before you need them and are scrambling for a solution! 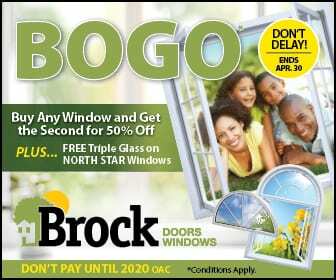 Keep reading for a bit of’ info from Brock Doors and Windows in Toronto, ON! Another type of partial replacement applies to double-hung windows: sash replacement. This type of replacement deals with exchanging a defective sash with a new one, if the rest of the window is in good condition. There are a number of ways to go about a full window replacement (meaning, the entire window is changed out—including the frame). A full window replacement could be necessary if you change the positioning or the size of the old/current window. And, of course, if a window frame is completely rotten. Project after project after project gets tiresome—even if you’re not the one physically handling it. In fact, homeowners are almost 50% more likely to call it “quits” after one or two renovation phases spread out over a long period of time. Moral of the story: if you can, replace everything at once. The key is to think about what will work best for you when the time comes. Waiting until you need to replace one or more windows isn’t optimal. Have a plan! The team here at Brock Doors and Windows would love to be part of it!